This sheet is at the printers now so expect it back in about a month to six weeks. 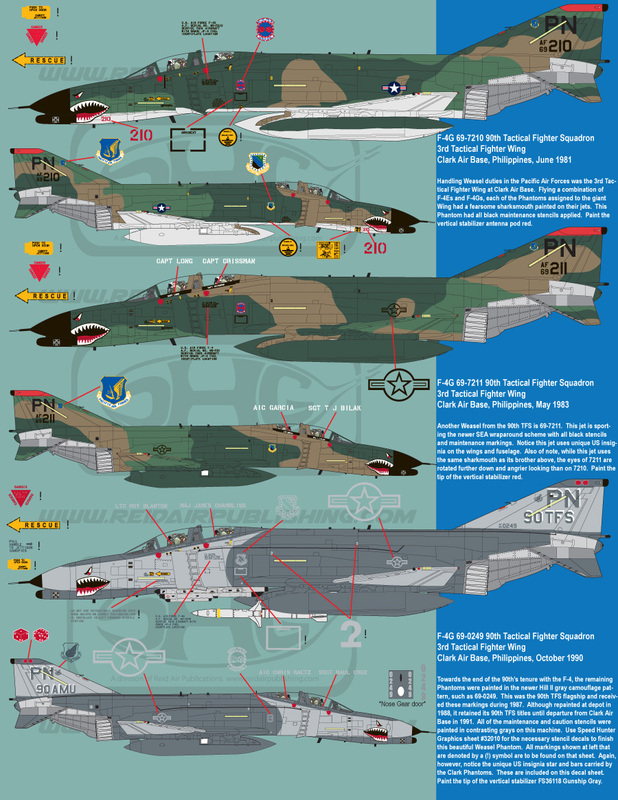 At least one option from every base that ever flew the F-4G, ranging from 1978 up to the jet that led the final 4-ship combat mission over Iraq in 1996. 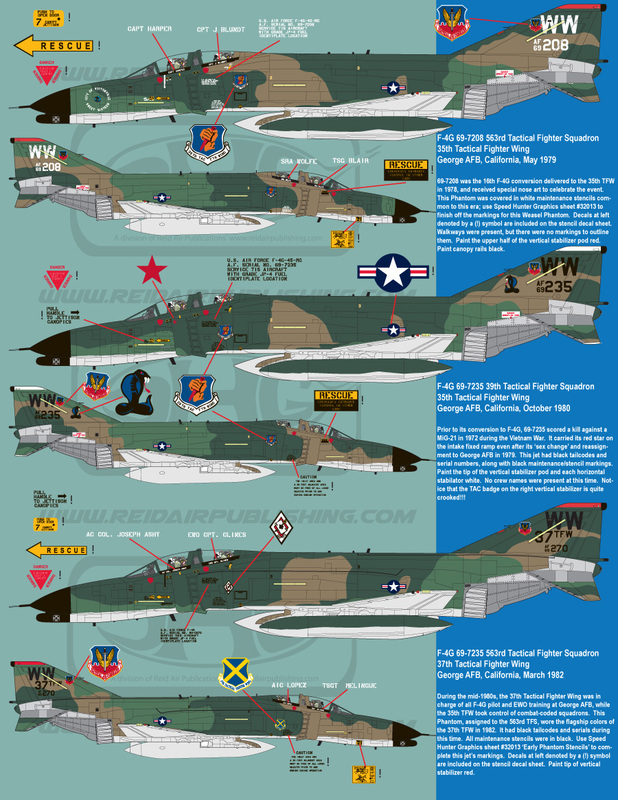 I've built a 32nd F-4G, 52FW, but bless me looking at this sheet , I'm seriously thinking about starting all over again..
That is a beautiful sheet .. and I'm SOOO Tempted! Jake, did George AFB not wear WW tail codes in the grey scheme before the birds were sent to Idaho? Bring it on Jake. Thanks. This is an awesome sheet, I'll be adding this one for sure. Yes, they did. 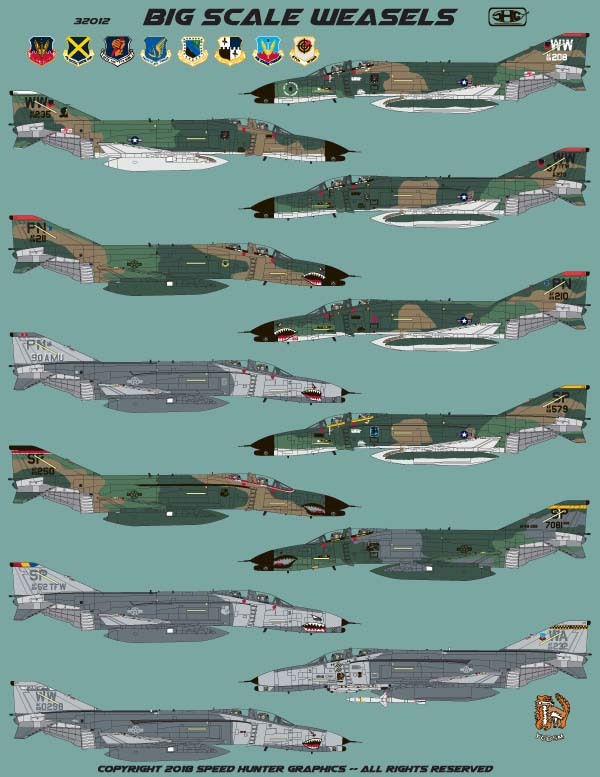 A few of those jets were on the first Weasel sheet I did a few years ago. 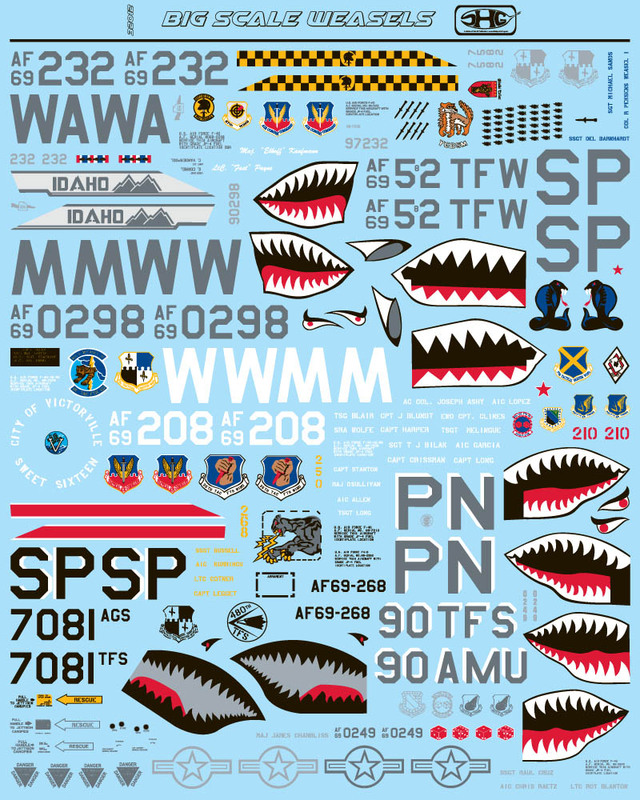 Will these decals fit the Revell of Germany F-4 kit 8n 1/32? It’s a very nice decal sheet!! Tempting! Yes, it's designed specifically for the Revell but I think I've designed it to fit both the Revell and the Tamiya w/conversion. Keep 'em coming, please do some AF 4-C/D's when you can..... 'William Tell' 57th FIS would be a good start!! This one is coming my way too btw! I hear ya, but I don't see it happening any time soon. I did a pair of C/D sheets a few years ago in 1/32 and can't give them away. No body wants them so I'm not too thrilled about dumping more money into the C/D versions unfortunately. Fair enough, the things have to sell. But I do notice that some subjects out there are repeated on other providers sheets, maybe people make a judgement that they have some of them already and give them the go by. I do that sometimes. The only thing I can say for that particular subject is that AFAIK nobody else has covered them in 1/32 scale before. The 57th FIS also had the 'E' model too so might be of interest to the F-4 fans out there? Perhaps it might be worthwhile getting some reaction on here to any proposals of that nature, test the water etc. Anyways, the F-4G sheet is great! At least you've sold another one here! Thanks. Sweet 16 and the 90th TFS! Sweet! Jumping like my Jack Russell!!!! 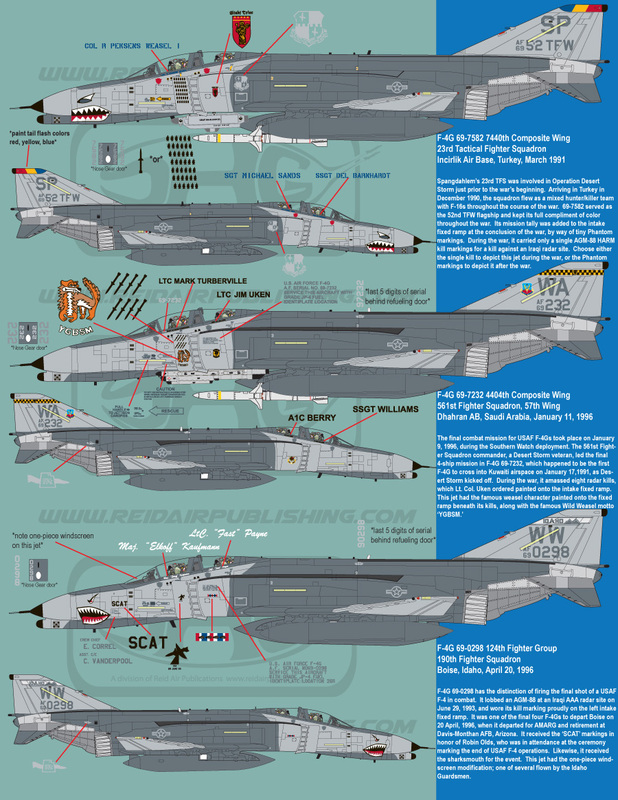 57th FIS F-4E in the gray and checkerboard stripes would be cool too! Decals are back and they are PHENOMENAL!!!! I'm waiting on the instructions to return from the printers and I'll turn on the ordering links. It should be tomorrow or Wednesday at the latest.